For one week in March, all the ICW Board Members gathered in New York City to attend the United Nations CSW62, ICW-RCA meeting and also to hold their annual spring board meeting at the EVEN Hotel Meeting Room on Saturday, March 17, 2018. 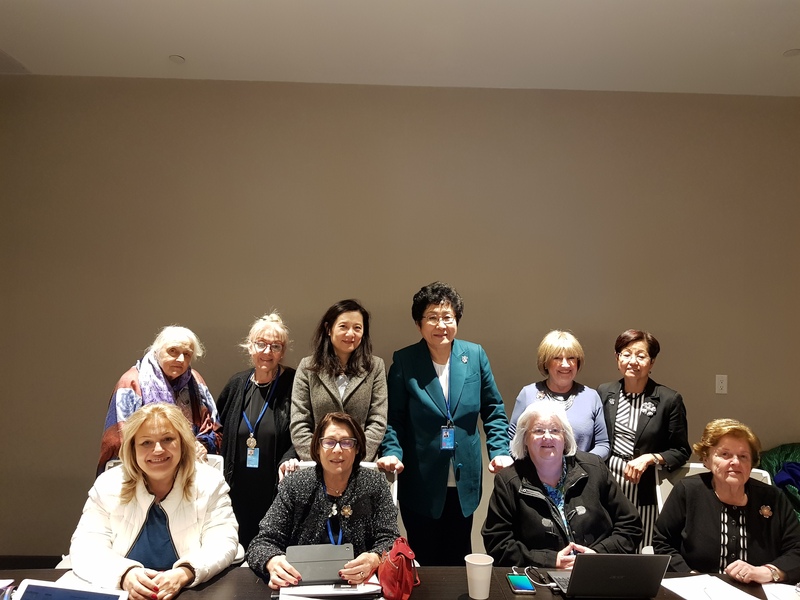 In her Presidential Report, ICW President Jungsook Kim expressed her delight that the Board Members took the time to come to New York to attend CSW and used the opportunity to meet and network with many women leaders from different parts of the world at the United Nations. She also conveyed her satisfaction with the success of the side and parallel events organized by ICW at CSW62 and the excellent speakers at ICW events, who were very well received by the audience filling all possible standing room and floor space. Dr. Kim also voiced her appreciation to the cosponsors of these events, the Korean Mission to the UN, the Mission of Jamaica, the Mission of Thailand, the Korean Ministry of Gender and Family, the World Health Organization and KNCW. She informed the board that she had purchased both handbook and online ads for ICW events besides printing flyers, which in addition to letting more people learn about the International Council of Women, have been beneficial to ensuring that ICW events are well attended. During the meeting, the Board Members reviewed the financial accounts, the status of affiliations and the various funds held by ICW. Finance Chair Hean Bee Wee presented the applications for the Mechta von Boogert award while Vice President Elisabeth Newman reported on her fruitful trip to South Africa to visit NCW SA and Lesotho. She noted her pleasure to meet with Daphne Hansen and other NCW of SA sisters and the members of National Council of African Women in Johannesburg. In addition to visiting NCW of Lesotho President, Patricia Mokhathali, Elisabeth had the opportunity to make acquaintance with the Queen of Lesotho and the founder of NCW of Lesotho. During her visit, she encountered the 2 trainers and 28 trainees from 14 organizations of the Small Development project training program on economic empowerment. Elisabeth also reported on the good progress in the work of UN representatives. Vice President Christine Knock discussed the situation regarding standing committee coordinators and advisors. Vice President Linda Liu related the status of the Lydie Rossini Project in India. Together with Elisabeth, they jointly reported on the Project Five-O developments, including the progress of an entrepreneurship training project in Papua New Guinea, the election of a new board and designation of new officers. Vice President Doris Bingley discussed issues relating to new affiliations. After the board finished their routine business, KOWANI President Giwo Rubianto, along with a team of six, including a government representative, joined the board meeting in the afternoon to present their proposals for the 35th General Assembly that will be held from 13th to 18th September, 2018 in Yogyakarta, Indonesia. ICW President and board members enthusiastically provided suggestions and advice based on their extensive experiences to ensure an excellent program for ICW’s major triennial event before the meeting closed at 6 pm. In order to secure additional time for board members and KOWANI to continue their discussions, ICW President Jungsook Kim hosted a delicious dinner for everyone that evening.